Fordyp deg i Cordobas fengslende kultur på en berikende helgedagstur fra Granada. Utforsk de mauriske monumenter og hellige strukturer av byen med en fullført privat guide; navigere i de svingete gatene i det historiske kvarteret og beundre et variert arkitektonisk bordau, så undre på de hvitkalkede gårdene og den gamle synagogen i det jødiske kvarter. Nyt personlig oppmerksomhet fra guiden din på denne private rundturen, hvor tallene er begrenset til å sikre en intim opplevelse. Avreise fra utvalgte Granada-hoteller i et komfortabelt minivan med aircondition, og slapp av under den naturskjønne reisen til Cordoba. Nyt den pittoreske omkretsen av Sierra Nevada fjellkjeden som din guide angir byens historiske scene. Begynn turen din på den kolossale katolske katedralen, en tidligere moske som ble forvandlet da kristne erobret Cordoba i 1236. Marvel på 1000 godteri-stripede søyler mens du utforsker den fantastiske Mezquita, og noterer arkitektonisk sammenblanding av barokk- og renessanselementer. Se hellige gjenstander som elfenbenskorsflikter og religiøse skulpturer i det innviete kardinals kapell før du går til neste destinasjon. Deretter spasere de smale smugene og brosteinsgatene i det jødiske kvartalet for å få innblikk i områdets turbulente fortid; beundre gotisk arkitektur og romerske gjenstander før du besøker en av de få synagogene som fortsatt står i Spania. Se på imponerende monumenter dedikert til fremtredende filosofer som Seneca, Averroes og Maimonides før du går tilbake til minivanen for den avslappende reisen tilbake til Granada. good guide and driver comfortable experience clear explanations overall a very worthwhile day! This was expensive but there were four of us, with two having been to Cordoba twice in prior years. We wanted the others to share the experience we had had. I didn't make the booking until the day before which caused a bit of on again off again due to Australia confirming the booking but Grandad not knowing anything about it. Things worked out! There were only the four of us transported by a private vehicle to Cordoba and then we saw firstly the beautiful gardens, Jardines del Alcazar, and the Jewish quarter, that we hadn't previously seen and then on to the Mosque/ Cathedral. A wonderful day enjoyed by all. The driver was extremely friendly and made the journey to Cordoba unforgettable by sharing lots of information about the destinations and places. The tour guide was friendly and provided all the necessary details we would want to know about the place. 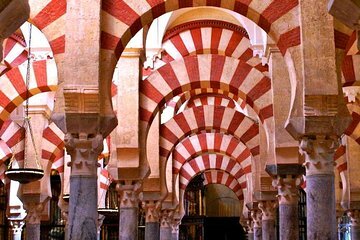 Cordoba is do-able from Granada, and definitely worth visiting, especially the mosque-cathedral. Viator driver and local guide in Cordoba both excellent: knowledgeable and courteous. Recommended. Cordoba was a must see. The history is fabulous. Our tour guide and driver were excellent. We could not be more pleased. Was a little disappointed with the tour in that it did not last as long as the itinerary had stated. The driver took a little longer to arrive in Cordoba (3 hours in total) than expected, but took the more historical route on the way there. We stopped off at an interesting little shop on the way which sold various products made from the local olive groves. Although we enjoyed the tours of the main sites, the guide was very friendly & enthusiastic. I would have appreciated being able to see other parts of the very pretty city of Cordoba with the time we had to spare. We arrived back at our hotel at around 6pm. I also felt the overall price for the tour was a little excessive.